Acne is a frequent skin problem suffered by most of the people to a varying degree. It specially occurs during the teen years. But it can not be said that the disease limited to any age group. Early adulthood and middle age people may have acne. 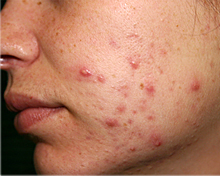 Some people believe that acne is common therefore proper treatment is not required. But these beliefs are wrong. If person ignore this skin disease, he is doing serious mistake. It is always better to take advice from good skin specialist and go for treatment to enhance appearance and self esteem, and avoid the development of lifelong scars. According to medical research, acne could be simply considered as a hormonal disease. The hormones are responsible for the maturation of the oil glands in our skin. Because of this reason, children are not susceptible to acne. Practically, the hormones may simply become unstable almost at any time because of more or less simple causes, there are also these specific periods when hormones get unbalanced. These particular stages are puberty, pregnancy, menopause when acne could attack on our bodies. Many Research reports demonstrate that the hormonal imbalance which leads to acne is mostly observed in women and also in teenage boys. Sometimes doctors advice women to take birth control pills, which in small doses and joined by other topical remedies also, can be used in reducing blemishes by keeping the androgens steady. But female should not attempt even considering using such type of treatment on her own without previously seeing a physician. They should not research on their body when some hormonal changes are taking place. If women follow advice of untrained people, it can lead to dangerous consequences. Increasing hormone levels during adolescence cause enlargement and over activity of the oil glands in the skin. There is a redness in affected areas which comes from the swelling of the skin in response to the infection. When the oil from the sebaceous gland merges with the dead skin cells, it blocks the hair follicles. This makes the skin bacteria to grow very fast. This infection develop swollen and redness in the skin, which becomes visible. Forehead, face, back, chest and arms are the areas where acne is mostly noticeable. Acne is not a very serious disease and people do not think that it is not curable. Recently, many effectual therapies have been developed. Dermatologists want to prevent scars that acne can leave. It has been noticed that people are not aware of acne and untreated acne can leave a permanent mark on a person's face and can have an effect on his or her self-image. Acne is usually controllable. Since acne has many forms, dermatologist provides treatment individually to care for successful control. The course of therapy will differ according to factors as type of acne, its severity and extent, and the patient's day-to-day activities. 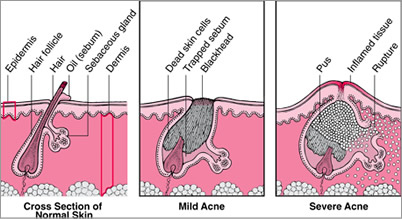 Acne Surgery: By this procedure, acne is cleared and improves appearance by manually removing blackheads and whiteheads. A round loop extractor is used to apply uniform smooth pressure to dislodge the material. Inserting a pointed instrument to carefully expose the contents loosens lesions that offer resistance. This may be combined with microdermabrasion, which facilitates to remove dead skin on the face and open up smaller blocked pores. Another therapy is intralesional Corticosteroid Therapy. If there are one or several painful acne cysts, this procedure will provide fast relief. Each cyst is given a single injection of a dilute cortisone solution, using a very tiny needle. It is to be noted that acne can not disappear with in a day or two. It is long process. Continuous treatment must be taken if the disease is to be controlled effectively. It is necessary to follow instructions of dermatologist to eradicate problem If people spend the time and effort to control acne, they will definitely get positive result. 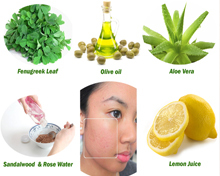 Nutritious and balanced Diet is helpful in the treatment of acne. It is established by expert that unhealthy diet can trigger acne. Some people argue that that diet has no role in most cases of acne. While many Dermatologists still consider this to be true. But many people agree that eating the wrong things can let loose the wrong kind of hormones. These hormones activate the oil glands in face. High levels of hormones are present in cow's milk, since most dairy cattle are pregnant. Milk is an important part of diet. But nutrients like calcium, vitamin D and protein can easily get from other foods, or from supplements. It may take 6 months off all dairy products before any improvement can be seen. Another assumption is that sugar and excess carbohydrates leads to acne. These push body to pump out insulin, which can throw off other hormones as a result. Some obese women with acne have hormone imbalances and excess insulin. In these women bringing the insulin level down corrects the hormone levels and acne. While there is no evidence that sugar and carbohydrates are important in most cases of acne, there is also no doubt sugar and unnecessary carbohydrates are not good for people. But developing good eating habits is the best approach to control acne. Some people blame particular foods for their acne such as chocolate and nuts, but these foods are not responsible for developing acne. The importance of diet may differ from individual to individual. It is recommended that before following any treatment, individual must take doctor's advice. Note: This information is just for knowledge of disease. If such type of medical condition develops, consult your doctor.